It’s Thursday once again, and you know what that means — time to throw it back a little. But here at The Cheat Sheet, our view of the past remains fixated on those occasions when the best basketball players on the planet made their moves toward the bucket, took to the air, and unleashed havoc upon the rim. One play. One flush. One moment frozen in time. And yet, enough to make an everlasting mark in the minds of basketball fans alike. We’re not envious of these powerful flights (of course we are), we’re all about showing our love to those instances that, even today, continue to give us chills. Last time, we took you on a trip around the world, to the moment when Vince Carter opted to fly international. 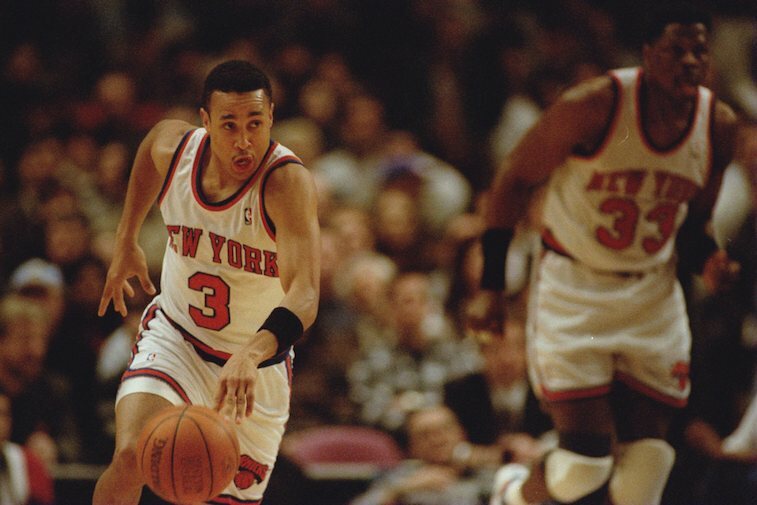 This time, we’re bringing it back to the hardwoods of the NBA, when former New York Knicks guard John Starks crafted his most memorable poster. In Game 2 of the Eastern Conference Finals of the 1993 playoffs, the No. 1-seeded New York Knicks found themselves in a position to take a two games to none lead over Michael Jordan and the two-time defending champion Chicago Bulls. With just under a minute to play in the fourth quarter, Bulls center Bill Cartwright missed two “crucial free throws” — the last one rebounded by New York’s Patrick Ewing — that would’ve cut into the Knicks’ 91-88 lead. Little did he know, those misses were about to set the stage for one of the most memorable dunks in NBA history. Starks had the ball on the right wing with 50 seconds left in the game and Bulls point guard B.J. Armstrong draped all over him. Ewing came up to set a screen, hoping to push starts to the middle of the court. However, Armstrong was giving up the baseline; most likely assuming he had help behind him. He didn’t. And Starks noticed. Opting against the screen, Starks drove right along the baseline, got to the hashmark, and took flight off two feet like he was shot out of a cannon. Chicago’s Horace Grant rotated and went to meet him in the air, only he was a step behind. Starks brought the thunder with a vicious left-handed dunk, posterizing Grant in the process (MJ would find himself in the background as well), and causing the fans at Madison Square Garden to absolutely lose their minds with excitement. While the throwdown essentially iced the game for the Knicks, it also cemented Starks place in the hearts of Knicks fans everywhere. Although the Bulls would storm back to win the next four games of the series, on their way toward eventually capturing their first of two three-peats, Starks’ flush was so powerful, so iconic, that it was immediately referred to as “The Dunk.” As throwdowns go, it doesn’t get any sweeter than that.